Thanks to Elon Musk, most people think battery-powered electric vehicles (BEVs) are the future of transportation. Tesla's (Nasdaq: TSLA) lithium-ion battery technology is impressive to be sure. But BEVs haven't won just yet. They have a serious competitor, and it's all around us. Hyundai's Nexo can do 380 miles on one tank of hydrogen. That's about what most modern cars gets on one tank of gas... and it's 40% farther than the Tesla Model X can go in between charges. The main issue with FCVs is the price tag. They retail for about $60,000. That's steep for a car you can drive only in California, the only state with large-scale hydrogen fuel infrastructure. For comparison, Tesla's first car, the Roadster, came with a sticker price close to $100,000 in 2008. The Model 3, the first "affordable" Tesla, didn't roll off the assembly line until 2017. The low-end Model 3 starts at $46,000. The point is the price of FCVs will go down over time. That always happens with new technologies. Japan is driving innovation in FCVs. That's why Honda (NYSE: HMC) and Toyota (NYSE: TM) are the market leaders. Japan sees hydrogen fuel as the future, and Tokyo is leading the way. The city's government is working on a fleet of hydrogen fuel cell busses and cars for the 2020 Olympics. By 2021, the Japanese government wants to have 160 hydrogen fueling stations across the country. Japan is throwing its weight behind hydrogen because it isn't connected to continental Asia's power grid. In a nutshell, Japan's location doesn't lend itself well to battery-powered cars. While Japan does produce some BEVs domestically - like the Nissan Leaf - the government wants to steer people to FCVs. FCVs aren't dependent on an intact power grid, so they work better in disasters, particularly in a country prone to earthquakes and tsunamis. It's not just the Japanese driving hydrogen fuel cell technology. The Germans are interested as well. They have a nationwide network of hydrogen fueling stations. Late last year, Germany rolled out fuel cell-powered trains. Mass transit vehicles and long-distance automobiles are fertile ground for fuel cell technology. Germany's new trains can travel 600 miles on a single tank of hydrogen and run quieter than their diesel counterparts. And while they have a higher sticker price, they're cheaper to run in the long term. Elon Musk may think hydrogen fuel cells are "fool" cells. But Toyota, Honda and Mercedes-Benz have plenty of capable engineers who think FCVs are the future. The battle for the future of transportation is far from over. Fossil fuels are living on borrowed time, but battery power hasn't claimed the throne just yet. 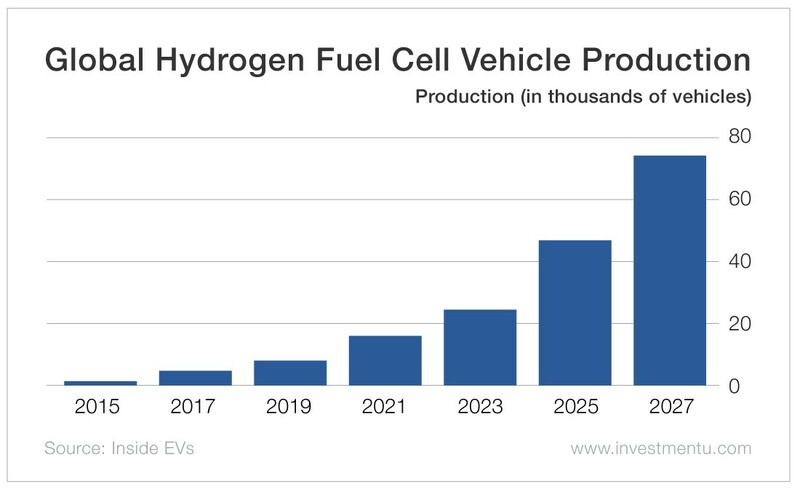 Look to companies developing hydrogen fuel cell technology, like Honda and Toyota, to rival Tesla for market share and profits in the green transportation industry. The future of green transit is far from certain, so hedging your bets with the two best replacements for gas-powered cars is the way to make sure you profit from it.